the chapel, with a fine roof of carved oak; and the library. Among its many literary treasures and curiosities is a superb Arabic Koran, presented by the governor general of India through Claudius Buchanan in 1805, who calls it "the most valuable Koran of Asia." The library also contains the archiepiscopal registers of the see of Canterbury in regular succession from the year 1278, and the parliamentary surveys of ecclesiastical benefices in the time of the commonwealth, now used as legal evidence. The parish contains many churches, charitable institutions, and other public buildings, some of them elegant and ornamental. Near Vauxhall bridge is the terminus of the Southampton railway. There are many manufactories, and several places of amusement, among them Astley's amphitheatre. 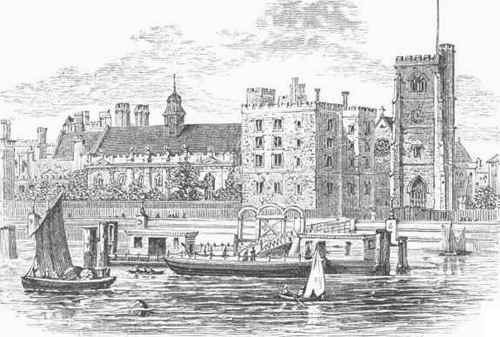 In September, 1867, a pan-Anglican synod was held in Lambeth palace, in which several American Protestant Episcopal bishops participated.